I just found this set 2015 at a Toys R'Us store near Charleston, West Virginia. I didn't waste any time building the model (without using the instructions) and writing up an article which describes the part selection, the build process and the finished model. The finished model is very detailed but pretty small. I enjoyed the build and think the finished model looks good. It is about average for a set in the Architecture series. It is a bit more repetitive and less engaging than some of the other models such as Big Ben, Eiffel Tower or UN Headquarters sets. 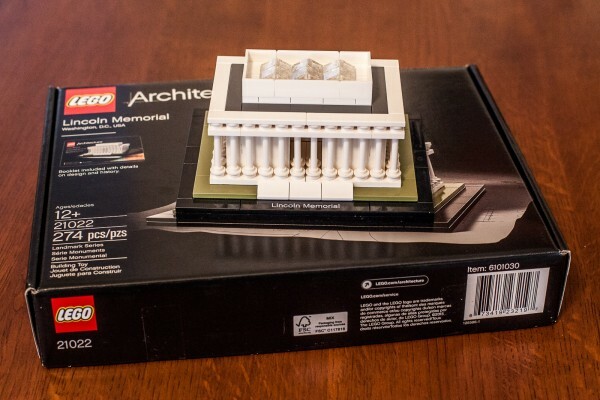 The part selection includes rare and expensive parts, and is a great addition to a LEGO Architecture Studio collection of White bricks. 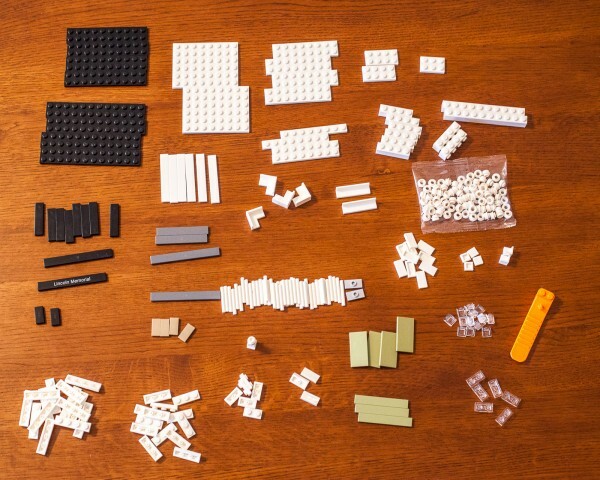 The most noteworty part is 87994 (Bar 3L) in White, since the set includes 46 of them. That part is rare, and currently runs for 0.43$/part on Bricklink, so we should expect prices for that part in secondary markets to collapse. Wow, so many white Apollo studs! It seems they're finally being integrated into regular sets. Hopefully that'll mean more colors. Just wait, this is sure to be mentioned over at the New Elementary in the near future. Tom, Thanks for the review! What was the price at that TRU? This is one of my most favorite buildings in the US because of what Lincoln stood for. Glad they issued the set! Yup, same price at TRU in Cary, NC, yesterday, but only two sets. I bought one and left the other. Hubby built it this morning, and it is very cool and very small. I like the small Architecture sets because they cost less and more easily fit on the display shelves. Hope that those looking for this online this morning were able to find it. There were only two copies in the store where I found it as well. They might have just put two on the shelf, or perhaps they are testing demand by only sending a few copies to each store. Our Chandler, AZ store had at least eight on the shelf today. I was hoping for a white Lincoln minifig as the statue. Oh well. ^ That would make a cool cmf. ^^LEGO's one is already a very repetitive so I would say that is a bad idea. 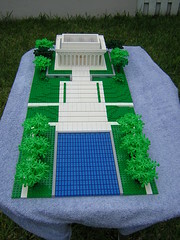 Seems odd to have a model of the Lincoln memorial without out Lincoln... Is there anything inside representing a statue? Edit: Just read your blog review and I see there's a white minifig head on a sort of chair. For £24.99 that is a great parts pack particularly for the 'Shaft 3M Ø3.2' and 'Pl.Round 1X1 W. Throughg. Hole' I think the LEGO Architecture sets should stick with 'Dark Green' for greenery, that olive colour looks odd with the white. Just checked the Raleigh LEGO store, and they were well stocked with all the new sets, incuding Lincoln, as far as I could tell. Picked up Birds 20131 for 45US. I also just picked up a copy of the Birds set at the Bellevue, WA LEGO store. got the DDC coming tomorrow and a Brick Link order of 2x2 light bluesh grey titles for my city side walk coming in hopefully this week.